Remote sensing is the act of collecting data without directly contacting its source. For example, scientists can determine the landscape of the ocean floor without walking on it. To do this, they send out sound waves from a ship on the ocean's surface. The sound waves reflect off the ocean floor and back to the ship. The scientists examine the way the sound waves echo back to the ship to determine the landscape of the ocean floor below. This method of remote sensing is called SONAR (SOund NAvigation Ranging). The flow of fresh water in southern Florida comes mostly from rainfall, 45-60 inches per year, on the Kissimmee River watershed in central Florida. About 70 percent of the rain falls during the wet season, which lasts from May to October. Before the conversion of land in southern Florida to farms and cities, the rain water collected into the Kissimmee River, flowed down to Lake Okeechobee, and wandered out through the Everglades to the Gulf of Mexico. The Everglades is a very wide, shallow, and slow moving body of water. It is about 50 miles wide, ankle to knee deep, and flows at a speed of about one meter per hour. A broad limestone ridge that is a few meters high runs down the east coast of southern Florida and prevents the water from flowing into the Atlantic. During the dry season (November to April), waterflow slows to practically nothing. For a few weeks each year, the Everglades sometimes shrinks to a string of standing pools until the spring rains recharge it. Image: Synthetic reconstruction of a U.S. Geological Survey satellite image of how southern Florida probably appeared about 1850. Increased human habitation in southern Florida significantly changed land and water use in the area after about 1930. Farmers were attracted to the area by rich soils. They converted the land south of Lake Okeechobee into farms and orchards. Tourists and businesses were attracted by the warm weather and beautiful beaches. They built Miami and other cities along the ridge on Floridas east coast. Cities like Orlando grew in the northern parts of the Kissimmee watershed. More water was needed for agricultural and urban purposes. This left less water available for the Everglades ecosystem. In addition, civil engineers constructed an elaborate system of canals and dikes to channel and drain off water during the wet season. This was done to prevent flooding of farms and cities. Most of the water that drained through these canals flowed across the ridge into the Atlantic. The canals and dikes reduced waterflow through the Everglades even further. By the 1980s, more than half of the available water in southern Florida was being diverted for human purposes. As a result, the Everglades ecosystem was drying up and dying. 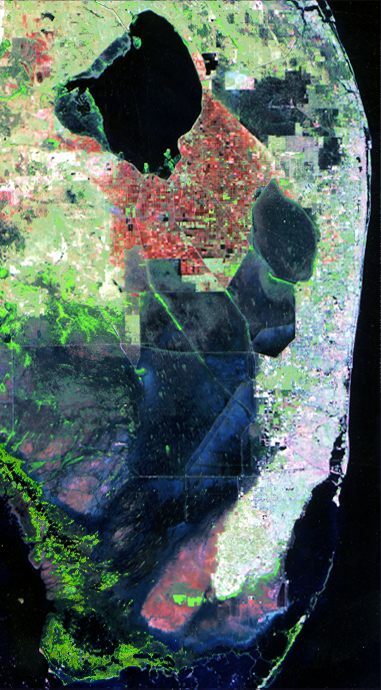 Image: U.S. Geological Survey satellite image of southern Florida in 1995. Restoration projects initiated in the 1990s are designed to redirect large amounts of water back into the Everglades. Some land south of Lake Okeechobee and land bordering populated areas around Miami will become wetlands again. 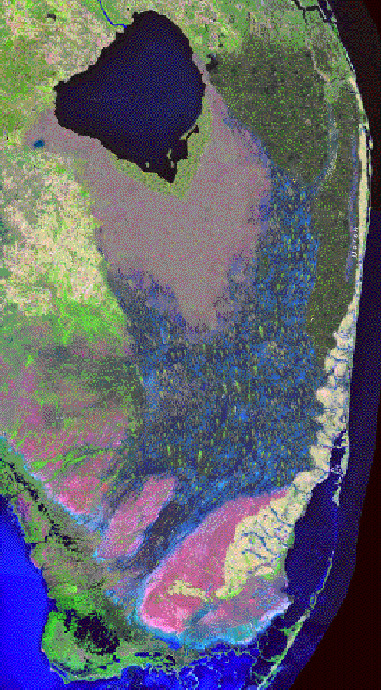 Surface flow and mean annual hydroperiod maps illustrate the flow and surface coverage of water in southern Florida at three periods in time: 1) about 1950--before major agricultural and urban development, 2) the late 1990s, and 3) about 2050--after completion of the restoration projects.